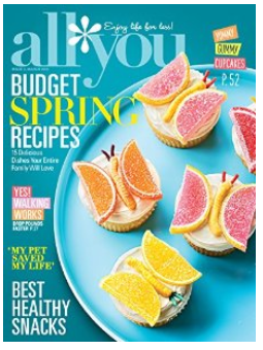 You can get a year subscription to All You magazine for only $5 at Amazon. This comes with FREE shipping too! Offer expires March 31st, at 8:59 pm PST. Enjoy Life for Less! Each issue offers high value coupons, money saving tips, affordable menus, easy recipes, fashion for all figures and budgets, and advice from real women like you. All You magazine deal is part of Amazon’s big $5 magazine sale , where you’ll find best sellers like O, The Oprah magazine, Cooking Light, Sports Illustrated & more, valid through 3/31. Keep in mind, All You magazine does come with an auto-renewal, but you can login and cancel the renewal right after you order the magazine, just click on the “Magazine Subscription Manager” on the magazine home page. That’s about all this magazine is worth anymore, the latest issue only had 2 coupons. The coupons are the main reason I subscribed to this magazine.